Get Pacific Rim or other Kaiju merchandise cheaply on Amazon. You too can earn money from writing articles by signing up for InfoBarrel. In Pacific Rim a dimensional rift known as the "Breach" has opened between Earth and another world and giant monsters, some with strange powers, called Kaiju - a Japanese word that, although it literally means "strange beast" is always translated as "giant monster." The first Kaiju destroyed San Francisco and more before it was finally stopped. The second arrived six months later and flattened Manila. After the third incursion, it became obvious that the Kaiju menace was not going to go away, and the nations of the world teamed up to stop them. Conventional military equipment was able to stop the Kaiju eventually, but was less than adequate to the task, so instead the Jaeger (German for "Hunter") program was initiated. Jaegers are giant, piloted robots - "Mecha" would be the conventional science fiction definition. Pilots controlled the Jaegers using a neural link. Problems with just one pilot controlling them resulted in the robots being controlled by two pilots joined through a neural bridge called the "Drift." 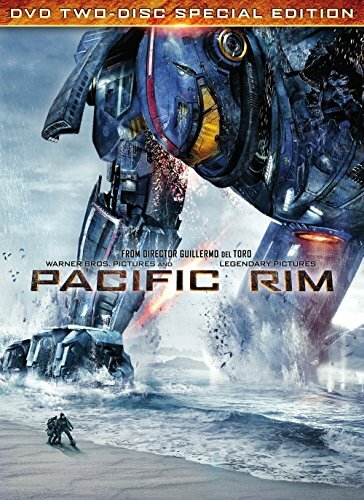 Credit: https://en.wikipedia.org/wiki/File:Pacific_Rim_FilmPoster.jpegThe film does not start at the beginning of what was called the Kaiju War when San Franciso was under attack. Instead, it starts seven years into the war in 2020. The pilots of the Jaeger are known as Rangers, and they are commanded by Marshal Stacker Pentecost (Idris Elba, Bastille Day, Ghost Rider: Spirit of Vengeance). The Jaegers have been very successful at defeating the Kaiju, with the pilots becoming celebrities in their own right. Raleigh Becket (Charlie Hunnam) is one such pilot in the Jaeger Gypsy Danger operating out of Alaska when everything changes, and not for the better. Pacific Rim does not start proerly until another five years after the pre-title sequence. Marshal Pentecost summons Raleigh to the Shatterdome in Hong Kong, one of the fortresses from which the Jaegers operate. At the site he meets the intriguing Mako Mori (Rinko Kikuchi), who seems to have a backstory of some type that is influencing things. This is what a Japanese Kaiju film would be if you had a really big budget to make one with, although in this film it isn't Tokyo that gets destroyed by the monsters - Tokyo being a popular target for destruction - but Hong Kong. Kaiju films are popular in Japan but have fairly small penetration in other countries, and probably the most well know Kaiju is Godzilla. Viewers familiar with the children's series Mighty Morphin Power Rangers, and most of its variants, will be familiar with battle scenes where giant robots battle giant monsters. This is again influenced by Japanese entertainment, with much of the Power Rangers costumes and battles coming from the Super Sentai series. Pacific Rim is available in both 2D and 3D with the 2D film being the one watched. The film is full of glorious, colourful battle sequences between the Kaiju and the Jaegers. This are fun to watch and are fantastic. Despite the whole monsters attacking and causing massive destruction plot of the film it is rather less gloomy and brooding than you would expect. It seems pretty obvious that Del Toro is a big fan both of Mecha and of Kaiju and he would seem to have finally made a film featuring them which will appeal to audiences outside the traditional Japanese market - Cloverfield is the only really comparable film in the Kaiju genre. There is even some humour in the film, most of it provided by the two researchers Dr. Hermann Gottlieb (Burn Gorman) and Dr Newton Geiszler (Charlie Day) who really don't get along with each other that well. This is a great fun film, even if it's not exactly big on plot and character development. There aren't any really big name actors in it - and it does appear that many of those who are in are British - but the film doesn't suffer from this. It's really about the battles between the Jaegers and the Kaiju, with some interactions between the characters to cause some required friction, romantic interest and background, but it's the special effects that make the film. Pacific Rim is gloriously portrayed futuristic fun. I would like to give you the "thumbs up" on this article but I could not find it! Well Done! Thanks! I wonder why you couldn't see the "thumbs up"? Perhaps a bug? Very good article and amazing movie! Everyone go see it! Thanks! Yes, it's a good film - better than you might expect.